If you need a nice ride in the beautiful city Sanya, just simply contact us now to get our BEST QUOTES and GREATEST SERVICES today! Car rental serivice provider in Sanya city China ! We drive your way in Sanya! 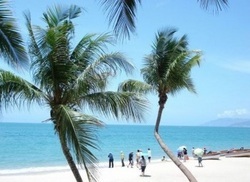 Sanya is lies at the southern tip of Hainan Island and is the second largest populated city in Hainan Province. The area has a tropical climate featuring very warm weather all year around .The city is renowned for its tropical climate and has emerged as a popular tourist destination, also serving as the training site of the Chinese national beach volleyball team. Sanya is a noted tourist resort with mountains, sea, river and city,the famous tour sites include Yalong Bay,The Guanyin Statue of Hainan,Tianyahaijiao(literally, "the place where the sky and the ocean meet", or "the end of the earth"),the tiger and crocodile centre and Nanshan temple etc.it is also a garden city full of coconut palms and other verdant splendors. Sanya is one of the most important foreign trade ports in the south of the golden coastline and also the important transport and communication center, which opens up to the outside world and it is often considered as "southern gate" of China. Due to its continuous development, new venues for resorts have been developed and numerous international hotel chains are now established in the area. Sanya attracts international travelers can be vitnessed by many Russian and English signs throughout the city. Shanghai Car Rental Service will be very honored to have the opportunity to serve you in Sanya with our great limousine services, we will insure a hassle-free, most comfortable trip no matter you are traveling Sanya for official business visits or personal tourists. All our drivers are from local and they are all licensed, well trained and with more than 6 years’ experience in serving our foreign customers, they are also quite familiar with the routes in Sanya and other cities in Hainan Province ,can easily drive you wherever you want. ◆Sanya airport transfer services ,hotel pick up and drop off . ◆ Sanya railway /bus station/ transfer services . ainan province . City tour sedan /mini van/mini bus/coach services for individual or group travelers. ◆Long-term car lease for individuals or cooperates in sanya. ◆Professional Business interpreter and Translator/Local guide services in Sanya.